Lombok is an island in the West Nusa Tenggara province of Indonesia. 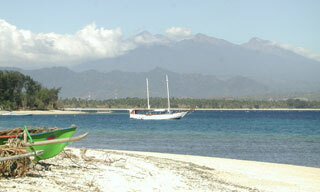 Located just east of Bali, Lombok in many ways lives up to or exceeds the promotional term, "an unspoiled Bali". With beautiful beaches, enchanting waterfalls, the large, looming volcano of Mount Rinjani combined with relatively few tourists, Lombok is indeed the paradisiacal tropical island that many people still mistakenly imagine Bali to be now. This article uses material from the Wikipedia article "Lombok", which is released under the Creative Commons Attribution-Share-Alike 3.0 License.